Nirvana Page wanted to see the world.1 Traveling by private seaplane with her father on their annual vacation, together they explore exotic places and discover remarkable wildlife, and even if it’s only for a few days, she gets everything a seven-year-old girl could hope for. That is, until a mysterious force crashes their plane, separating Nirvana from her dad, and stranding her in a strange and unfamiliar land. It’s there she encounters Sithrah—a mysterious being who could hold the key to finding her father—and begins a grand and perilous adventure that will bring her to the end of the world and beyond! 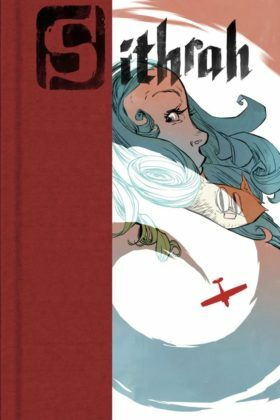 Sithrah is an all-ages book embracing a mixture of comic art and prose in a way that has never been done before. Book 1 of the Sithrah graphic novel series. I’m checking this out right now. Thanks for the tip, Kristy!